If I told you this music was food for the soul, some might think I was talking about soft, contemplative music. Where there are a couple of sweet, soft love songs and one that I hope will get you thinking very seriously, sometimes food for the soul means celebration! “Living All the Way” is such a musical work. Several of the songs are great for a good aerobic workout – taking in those upbeat thoughts while breathing fresh life into your body. Each song has its own story. It is my hope you are inspired and brightened by each one. Buy the CD or individual tracks at CDBaby! 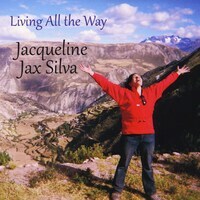 All vocals by Jacqueline Jax Silva except on Keep Listening Reprise, Family Version as noted. All recordings made and instruments played by Daniel Nahmod, Humanity Music, Orange County, CA except as noted. Engineering, mixing, and mastering: Daniel Nahmod, Humanity Music, Orange County, CA. 5. Truly Love Again – All instruments: Tripp Sprague, Recorded at Tripp Sprague’s Studio, San Diego, CA. 10. Keep Listening – Keyboards & Bass: John Giulino, Guitar: Guy Gonzales, Drums: Toby Ahrens, Recorded at Tripp Sprague’s Studio, San Diego, CA. 11. Keep Listening Reprise, Family Version – Keep Listening was the first song I recorded for this CD. I originally invited my family to help me with the backup vocals. This rougher version of the last choruses and a bunch of ad-libbing came from that original track and is very, very cute. Thanks to my loving backup team Geoff Lizar (son), Daniel (nephew), Heather (niece), and Ray Nagey (brother), and Barbara Peisch (singing buddy).